After weeks of huddling in partisan secrecy, majority Republicans in the U.S. Senate have coughed up what they’ve dubbed the Better Care Reconciliation Act , aka their version of Trumpcare. To the dismay and wide criticism of many, GOP senators would gut Medicaid. Republicans long have decried as “welfare” this increasingly popular program which benefits the poor, children, disabled, chronically ill, mentally ill, and the old. The Medicaid cuts—calibrated so many of their effects won’t be felt immediately but down the road— may be some of the most harmful aspects of the senators’ bill. The BCRA, as the House’s AHCA , robs from the poor to benefit the rich with hundreds of billions in tax cuts. Wealthy Americans may get an especially sweet deal because one of their big income sources, capital gains and dividends, will get a retroactive tax cut, such that a mogul who has sold, say, $1 million in stocks any time since Jan. 1 would benefit to the tune of $38,000. And, by the way, how many taxpayers will parse the Senate version closely enough to see that the already lavishly rewarded executives who run health insurers will benefit from this GOP bill, which lifts caps on their compensation? Partisans insist the bill maintains protections so Americans with preexisting conditions can get health insurance. Critics say this isn’t so. They also ask if the GOP, in both the House and Senate versions, has tweaked health laws in such a way that it soon may lead employers to pare or drop the coverage they provide to most Americans. Employers and insurers may quickly use the BCRA to reimpose annual and lifetime caps on coverage, moves particularly adverse to those with cancer and chronic illnesses. Though partisans insist otherwise, the GOP Senate bill for most of us will lead to higher premiums and deductibles—aspects that already are making health insurance unaffordable and inaccessible for so many. Topher Spiro, a health care expert, has posted on social media that analyses by his organization, the Center for American Progress, and others sees deductibles for some of the poor increasing from $100 to $7,500 annually. That means they effectively will not have coverage, though to get the barest minimum they may be buying skimpy policies that would pay for next to nothing. Americans who are poor, sick, and older—that being 40 and above to the members of a lawmaking body with an average age of 61—will be hardest hit by the latest version of Trumpcare. The measure, critics say, also harms women with its effort to defund Planned Parenthood, reignite abortion controversies, and by undercutting support for reproductive health. The measure strips away funding for public health and prevention programs—eliminating save for a relatively small sum the support to battle the epidemic of opioid drug abuse. Even as some members of Congress were maneuvering to provide $40 billion for that fight and experts estimate its depth and complexity will require $190 billion over the next decade, the BCRA offers $2 billion. There’s lots of legislative legerdemain ahead, behind the scenes dealing, and the BCRA’s scrutiny by the independent, nonpartisan Congressional Budget Office, which will provide a score on the measures costs and effects. Let’s see how many millions of Americans the CBO estimates will lose their health care because of the Senate’s version of Trumpcare. Democrats, including a rare opposition by President Obama, have been united in denouncing the bill, while GOP senators almost immediately postured about it, indicating that they wanted their favored causes to get more money in it. Senate Majority Leader Mitch McConnell, knowing no Democrats will support Trumpcare, must win at least 50 GOP votes so Vice President Pence, as the Senate’s presiding officer, can cast a tie-breaker. Because of the arcane way Republicans have sought to shove an ACA repeal and replacement through Congress, Senate rules, interpreted by the body’s parliamentarian, will come into play. This may cause items that cannot be directly linked to the national budget and its reconciliation to be stripped from the BCRA—meaning a potential battle over abortion may not occur. 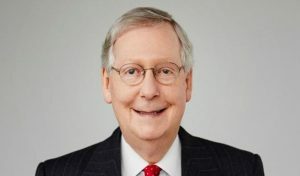 McConnell also has tried to frame the version of the BRCA that’s public now as a “working draft.” Analysts say he may, in keeping with Senate practices, allow for many amendments to it, especially by Republicans, waiting until mere minutes before a final vote on the bill before substituting it wholesale with yet another version that will include changes to that point. Even as complaints rise about the secretive way the bill was put together (with Republicans only and mostly by their most conservative members) and its various described shortcomings, the bill—polling as one of the most unpopular in recent memory—is speeding ahead for a vote before Congress takes its July Fourth recess. That will mean Congress, and the Senate especially, has whipped through giant changes in a $3 trillion sector of the economy affecting all Americans in a matter of weeks, with little, open, public consideration and expert consultation. This is not the right or good way to pass laws, especially big and complex measures that affect all Americans. In my practice, I see not only the significant harms that patients suffer while seeking medical services, I see how so many of us struggle with the pains of the soaring costs of medical care. Health insurance is critical and its benefits are more than self-evident. But it is not the only component in ensuring our health and well-being. It is disappointing that lawmakers have so focused on imposing their partisan views, especially the notion that wealth makes right and should engender privilege, that they haven’t dealt with other critical basics of medical care, such as quality, safety, cost, and access. Obamacare is far from imperfect. It did try to address those matters and Trumpcare, particularly because it is going through the budget reconciliation process, does not. Analysts have insisted that a serious consideration of improving the nation’s health care system would involve deep struggles with numerous trade-offs. The reverse Robin Hood approach by the GOP doesn’t do that. There but for the grace of God we all go. Disease does not discriminate and in a blink any of us can be beggared, cast into the lot as “platinum patients”—the ever changing group of people with astronomic medical costs to bear. Let’s hope in sunnier times we consider how we will want collective help with the burdens.